In 1938 another division was made by Pope Pius XII 1) The whole civil district of Ramnad except the parish of Mookkur and 2) the taluks of Sankarankoil, Tenkasi, Ambasamudram, Tirunelveli and Kovilpatti excepting a portion along the coast-all belonging to the civil district of Tirunelveli and 3) six out of the eight taluks of Madurai district: Madurai, Tirumangalam, Periyakulam, Kodaikanal, Nilakottai and Melur were cut off from the diocese of Tiruchirapalli and made into the Diocese of Madurai. The then bishop of Tiruchirapalli Msgr. J.P. Leonard, S.J. (1936-1938) was transferred to the new See and the Diocese of Tiruchirapalli was handed over to the Diocesan Clergy with Msgr. James Mendonca, (1938-1971) as its first Indian Bishop. When Msgr. James Mendonca retired in 1971, Msgr. Thomas Fernando was transferred from the See of Tuticorin to the Diocese of Tiruchirapalli. Rev. Fr. Sengole Lawrence Gabriel, was elected on October 26 of 1990 and consecrated as the Bishop of Tiruchirapalli, on 30th December 1990 and took charge of the See of Tiruchirapalli on the same day. At his request, Bishop Gabriel was relieved from the responsibility of the See of Tiruchirapalli and Bishop Peter Fernando, the Co-adjutor Bishop of Tuticorin was appointed as the Apostolic Administrator on 14-10-1997. Bishop Antony Devotta was consecrated and took charge of the See of Tiruchirapalli on 28th January 2001. Having reached the age 75, Bishop Antony Devotta submitted his resignation and the Holy Father Francis accepted his resignation and appointed Bishop Devadoss Ambrose, Bishop of Thanjavur, as the Apostolic Administrator of Trichy diocese on 14th July 2018. The present diocese of Tiruchirapalli comprises parts of 3 districts at present: Taluks of Tiruchirapalli and Manaparai (from the District of Tiruchirapalli), Taluks of Kulithalai (from the District of Karur) and Taluks of Kulathur (from the District of Pudukottai). The river Cauvery is the border line between Tiruchirapalli Diocese and the Dioceses of Coimbatore, Thanjavur and Kumbakonam. 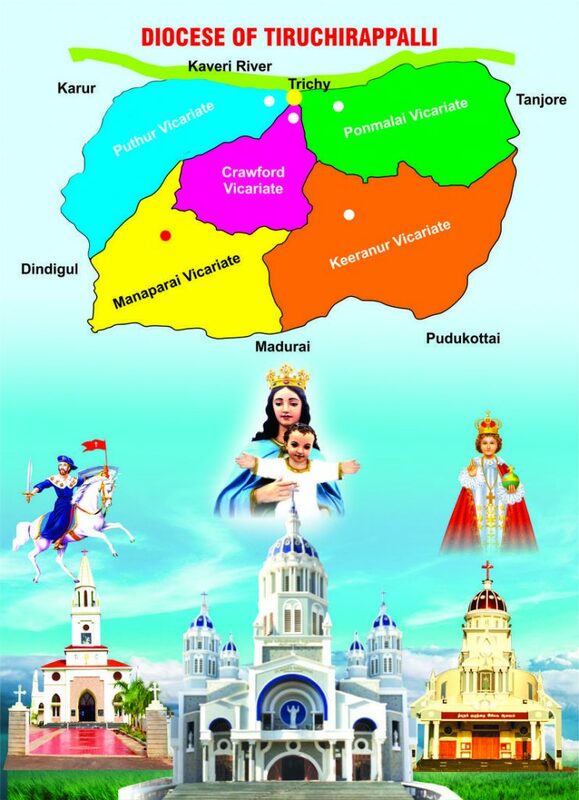 The diocese consists of 73 parishes grouped into five Vicariates: Vicariate of Puthur, Crawford, Ponmalai, Keeranur and Manaparai.